Building e.g. 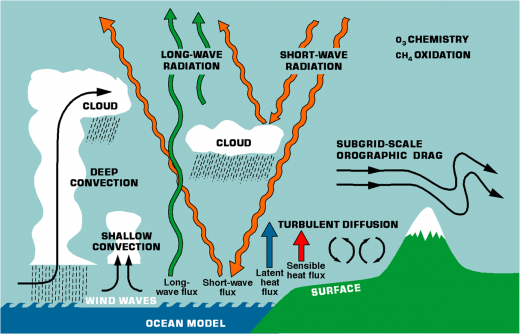 the atmospheric part of a global climate model is done in two major steps. First the core is formulated, i.e. defining the equation system, choose numerical methods and calculation grid for the resolved flow. Then, standard idealized tests are performed to assess the performance of the core. Likewise, in the second phase, when parameterizations are constructed, i.e. the description of how processes that occur on small scales influence the resolved scales, test are performed and the performance is asses in idealized cases or special “controlled” cases when observations are available. The core and the parameterizations are then combined to form the complete model. Crucial for a climate model is that it is possible to efficiently run it for long integrations. Thus the numerical methods, grid and integration timestep are all optimized for a fast performance. However, recent evidence show that the current practice by using e.g. sequential time-splitting might not be optimal. Another issue is if it is appropriate to do substepping for quantities with rapid adjustment time scales. With increasing complexity of the parameterized processes and decreasing grid spacing the importance of the numerical issues are not reduced. In this project, we aim at systematically study one or more of these issues in a global climate model.